Historically proven to do exactly what the marketing hype says it will do, in either a duty function and in a concealed carry function. This is a rare example of a round that actually exceeds its purpose for those who use it. 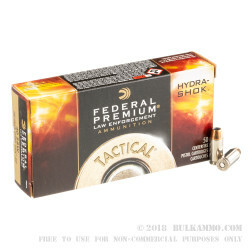 This self-defense 40 S&W ammo brings a proven track record of performance. The engineering behind the round is several years old and it still holds its own against the newest iterations of every other manufacturer’s premium round in competition with it. 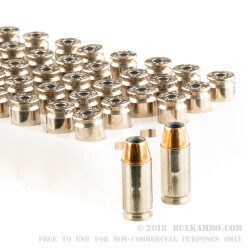 A 180 grain projectile that sits in a nickel plated brass casing made for easy feeding, easy cleaning and easy reloading, wit the Boxer primer. The Hydra Shok bullet is a clear contender due to the controlled expansion and sufficient penetration. Expect muzzle velocity of 1,000 feet per second and muzzle energy of 400 Ft. Lbs., making this a moderately hot round for the range, but the recoil feels muted and the powders do burn very clean. 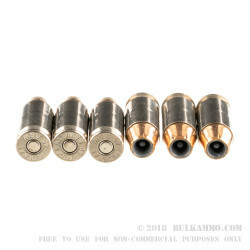 The combination of the reliability of the Federal Premium ammunition combined with the proven performance of the Hydra Shok bullet makes the load a great choice for those discerning owners that don’t want to listen o marketing hype anymore but instead just want a high performance round that can deliver the results needed.